The Waterflex Check Valve is specifically designed for potable water and clean water applications with low suspended solids. The valves are NSF61 Certified for potable water applications. The Waterflex comprises a rod-guided ply-reinforced membrane and perforated disc. The Waterflex is available in a full-body design (WF-1), a wafer style (WF-2) and full-faced wafer style with ANSI, DIN or other standard drilling pattern (WF-3). Waterflex Valves have low headloss and a high backpressure rating and do not have moving parts such as hinges and springs that can seize if routine maintenance and lubrication is not performed. Waterflex membranes are fabricated in dedicated compression molds and are ply-reinforced for superior durability. Waterflex operate solely on differential pressure – forward differential pressure deflects the membrane away from the perforated disc allowing flow, reverse differential pressure forces the membrane against the disc to prevent backflow. 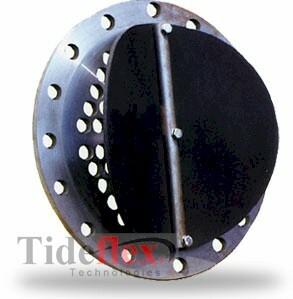 Waterflex eliminate bang and slamming problems common to conventional swing check valves.